Meagan's Iowa case garnered national attention as an important reminder that transgender people are explicitly protected by state civil rights laws from discriminatory treatment. Des Moines, Iowa--UPDATE: The ACLU of Iowa is pleased to report we have successfully settled Meagan Taylor's case to the satisfaction of the parties involved. "The ACLU of Iowa is so proud to have represented Meagan in this important case," said Rita Bettis, ACLU of Iowa legal director. "Meagan's case garnered national attention, and has been an important reminder to those in the criminal justice system and who run businesses and other public accommodations in Iowa that transgender people are explicitly protected by our civil rights laws from discriminatory treatment." "Given the attack on transgender people happening across the country, we in Iowa are proud and thankful to work in a place where transgender people are afforded dignity and protection under our state law," Bettis said. Bettis said, "As Meagan's case demonstrated, the public accommodations laws so much in the spotlight right now are about far more than bathrooms. It is important that we protect transgender people from discrimination in public life so they may go about their lives without fearing harassment, discrimination, arrest or violence simply because of who they are. " Thank you to Meagan for bravely standing up for her rights and to the outstanding ACLU of Iowa volunteer attorneys in Des Moines who worked with us on Meagan's behalf: David Goldman of Babich Goldman, for Meagan’s Iowa civil rights case, and Jake Feuerhelm of Feuerhelm Law Office, PC, and Joe Austen of Austen Law Office, PLLC, who successfully worked for dismissal of her criminal charges. 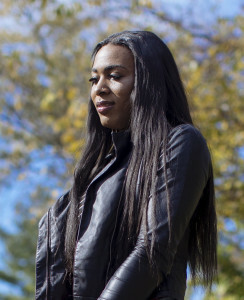 November 2016: The national American Civil Liberties Union and the ACLU of Iowa filed a complaint with the Iowa Civil Rights Commission against The Drury Inn in West Des Moines for discriminating against Taylor, a Black transgender woman based on her gender identity and race in July 2015. Meagan, a Black transgender woman, and her best friend, who is also Black and transgender, checked into the Drury Inn, a hotel in West Des Moines, Iowa, on July 13 while traveling from Illinois to Kansas City for a funeral. Despite the fact that she and her friend had made reservations and that she was a regular patron of Drury Hotels, the pair were harassed and felt unwelcomed. Before finalizing the check-in, the front desk clerk—at the request of the general manager—asked to make a copy of Meagan’s ID even though they had already processed payment and checked her ID once. Like many transgender people, Meagan has not been able to update the name and gender on her ID so the identification listed her birth name and gender. Called Police Because of "Men Dressed Like Women"
As a result of the Drury’s discrimination against her, Meagan was arrested and charged with possessing her hormone pills without a copy of the prescription—charges that were eventually dismissed. There was no evidence of prostitution and she was never charged with it. After arrest, she was held for eight days in Polk County Jail before being bonded out, never making it to the funeral in Kansas City that she was traveling to attend.